Climbing Gym, Rock Creek Outfitters To Locate In Former Bijou Site "The Block"
A climbing gym along with Chattanooga-based retailer Rock Creek Outfitters will be occupying space at the former Bijou Theatre, officials of the River City Company announced with fanfare on Thursday morning. This $4 million investment to a 25,000-square-foot downtown space will also create approximately 40 jobs. Construction begins in January with Rock/Creek slated to open its doors in July 2013 followed closely by High Point Climbing and Fitness in August. 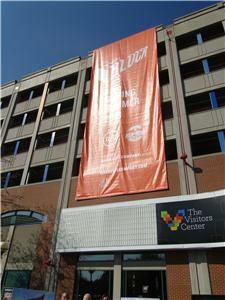 The block in front of the former theater was closed and, during the presentation in front of a crowd of onlookers, River City unfurled a 100-foot banner from atop the parking garage revealing that the city block bordered by Second and Third streets and Broad and Chestnut streets will now be known as The Block. Kim White of River City said, "Renovations of The Block will rejuvenate the exterior street presence with new storefronts, entrances, canopies around the perimeter, streetscape amenities and a renovated CARTA shuttle breezeway." A main feature is that the exterior of the tall building along Broad Street will be outfitted with a large piece of public art that will double as an exterior climbing wall. Ms. White said, "Since downtown Chattanooga’s Bijou Theatre closed in 2009, the high-visibility Broad Street building has remained mostly vacant. 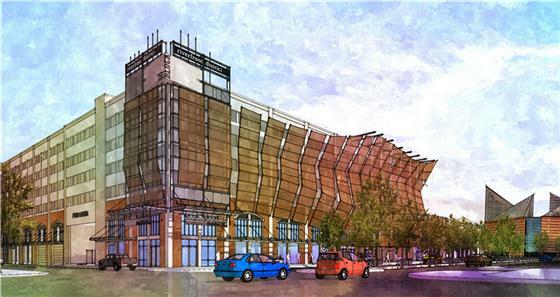 Through the years many rumors have circulated about the future use of the first floor of the CARTA parking garage and shuttle depot, which has been partially occupied by the Chattanooga Area Convention and Visitors Bureau since 2010. Today, River City Company, which manages the building, put rumors to rest and unveiled plans to renovate the space and reanimate the city block in the heart of the Riverfront District. "We’re very excited about this new development and the impact it will have on tourism," said Bob Doak, president and chief executive officer of the Chattanooga Convention & Visitors Bureau. "As far as our Visitors Center, we knew coming into this space that it was a temporary location. We’re currently exploring multiple possibilities for a permanent home that will best serve our visitors." The all-new repurposed interior will house Rock/Creek and High Point Climbing and Fitness, with two remaining retail spaces available for lease. The total cost of renovations is estimated at $1.5 million, with construction beginning January 2013. Rock/Creek and High Point will open in summer 2013. Ms. White said, "Since Carmike’s relocation with the Majestic redevelopment in 2009, we have been working with a variety of concepts to bring both retail and an entertainment aspect to enhance our other riverfront offerings. 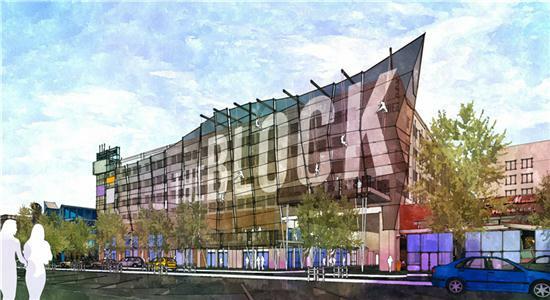 The Block redevelopment is a perfect marriage of River City’s live, work, play downtown mission and the creative entrepreneurship of Chattanoogans that continue to breathe new life into downtown." She said local entrepreneur Dawson Wheeler and his partner Marvin Webb have grown Rock/Creek, a Chattanooga-based specialty outdoor retailer, from one brick-and-mortar store "to a four-store and online retail business that is recognized as one of the best in the outdoor recreation industry." Rock/Creek will open a 3,800-square-foot flagship location on The Block that will feature outdoor apparel and equipment from top brands for a host of sports including kayaking, rock climbing, camping, hiking, trail running and adventure racing. "The Block redevelopment concept and complimentary mix of tenants is authentic to Chattanooga’s signature outdoor lifestyle," said Mr. Wheeler. "This location will complement the other four retail locations in this region and allow us to extend our reach to the millions of residents and visitors who enjoy downtown amenities." 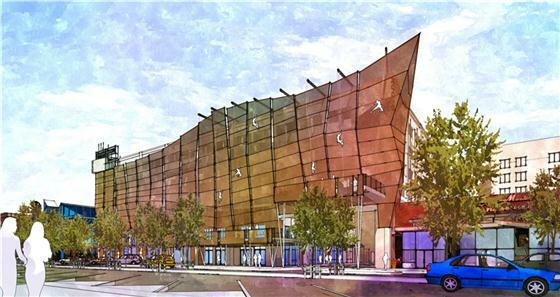 High Point Climbing and Fitness will occupy 16,490 square feet and will feature indoor rock climbing walls and bouldering, a fitness center and pro shop. The business will offer equipment rental, lessons and coaching, youth programs, competitions and more. A pit will be dug inside the facility to allow indoor climbing as high as 40 feet. This will be the third local climbing gym. Ms. White said it has not yet been determined whether the former theater's iconic tall lighting feature will be retained. It is not shown in an artist's sketch. The theater overhang is due to be removed. "Over the past 20 years, Chattanooga’s downtown has become a mecca for residents and tourists alike," said Allen Corey, president and CEO of CraftWorks Restaurants and Breweries, Inc. and River City Company board member. "And just when we think — and Outdoor Magazine readers confirm — that we’re the ‘Best Town Ever,’ we find a ways like this to top even that." Expand the tourist attractions available to visitors of Chattanooga, as well as serve the local market with a fun, exciting fitness alternative. Equipment rental, lessons and coaching, youth programs, special group programs, competitions, cardiovascular and weight training equipment, yoga classes, massage therapy, locker room and shower facilities, pro shop for gear purchase. John is a successful entrepreneur, a competitive triathlete, a member of the Rock/Creek race team and a new rock climbing enthusiast. John has significant experience in the acquisition, financing and operations of healthcare companies. He began his career at Life Care Centers of America, Inc. and advanced through the company in the finance area. In 1996, he was appointed president and was responsible for the operations of the company and over 20,000 employees. In June 1999, John left Life Care to pursue his desire to build his own company. Today, John and his business partner Byron Defoor own and operate 37 nursing homes with revenues in excess of $250 million and 3,500 employees. John and Byron, along with Chuck Jabaley, also formed a specialty finance company which has made over $500 million of investments in various healthcare companies. Today, John actively works in the company and serves on the credit committee. Wiygul is an outdoor enthusiast, member of the Rock/Creek Race Team and accomplished rock climber who has mastered routes throughout the United States and Europe for more than a decade. He is also a nationally -ranked triathlete and earned All-American status in 2011. He has competed in four Ironman events and over 66 endurance races, including the Ironman 70.3 World Championships. John will graduate with a Bachelor of Science in business administration and entrepreneurship from the University of Tennessee at Chattanooga in the spring of 2013. For the last several years while pursuing his degree, John has been working with John O'Brien and has gained invaluable insights into various aspects of business. As a result of this mentoring relationship, O'Brien and Wiygul have decided to partner on the formation of High Point Climbing and Fitness. Dawson Wheeler has co-owned Rock/Creek with business partner Marvin Webb for the past 25 years. He is also a founding member of the non-profit Wild Trails. A lifelong outdoorsman with roots in experiential education, he currently serves on the board of directors for Grassroots Outdoor Alliance and the Outdoor Retailer retail advisory council. He has formerly served on the board of Tennessee River Gorge Trust and Ralph Lauren's retail advisory board.